I found it in a book of Burns works given to me after my grandfather died. The paper is very yellow with age and is suffering from the folding. We have tried various methods of preparing the page for transmission, finally photographically repairing the ''fold'' damage which made reading difficult. It would be a discussion point with the "Robert Burns" supporters as to whether he did or did not write this poem. Burns himself is supposed to be the author of the following verses. 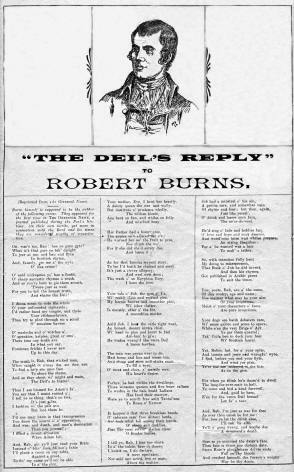 They appeared for the first time in The Greenock News, a journal published during the Poet's lifetime. On their own merits, yet more in connection with the Bard and his times they are considered worthy of resuscita-tion. Oh, wae's me, Rab! hae ye gane gyte? O' sharp sarcastic rhymes a routh. When caught in crimes that are their am. Thus I am blamed for Adam's fa'. But destitute o' prudence wholly. An' took what fell among their hands. I lookit on. I do declare. O' love and hope and mirk despair. Note: We've pretty much figured that this is not a Burns poem.